There was a wealth of vocal talent on the scene in the swing and bop eras. Some of it came from instrumentalists who sang mainly as a novelty, like Dizzy Gillespie. Even Duke Ellington was known to sing on occasion; he accompanied himself on an acetate of "I've Got To Be a Rug Cutter" as a gift to Leonard (Feather) in the mid-'40s. Other musicians such as Louis Armstrong and most notably Nat Cole , became better known as singers than as players. When Cole recorded "The Christmas Song" with strings in 1946, he gained worldwide recognition from a mass audience that hadn't been familiar with the ultra-cool music his trio had performed since '39. It was Les Brown's band that started Doris Day on the road to commercial success, and John Kirby's that introduced Maxine Sullivan, who had a hit with "Loch Lomond." 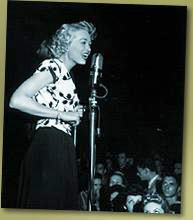 (Stan) Kenton singers June Christy and Anita O'Day popularized a new smoky sound, and topped the jazz polls in the late '40s. At that point, one of the best-known singers who ever fronted a big band - Ella Fitzgerald - had already been triumphing in both the jazz and pop worlds for over a decade. Duke Ellington plays and sings "I've Got to Be a Rug Cutter"